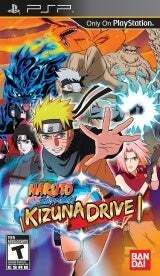 Naruto Shippuden: Kizuna Drive pits Naruto and friends against an unseen foe responsible for the disappearance of ninja from Hidden Leaf Village. New characters will descend onto the scene and unexpected plot twists are revealed as players discover who seeks vengeance upon Naruto. In Naruto Shippuden: Kizuna Drive, two modes of play will be available to challenge everyone's ninja prowess. In Story Mode, journey with a band of NPCs (non-playable characters) through more than a dozen missions that await to be conquered. In Free Mission Mode, build a ninja dream team to overcome daunting combat situations where up to four friends can fight together and perform special combo moves via ad hoc. Featuring a new Kizuna Drive Combat System, players can chain devastating attacks onto enemies as each teammate inflicts crippling damage one after another. Time attacks precisely to apply even more intense blows, but miss the mark and the damage will be reciprocated. Last edited by jibbz; 03-25-2011 at 07:20 PM. Works fine on my PSPgo 6.20TN-E with prometheus loader and sony driver. It requires much more than a simple eboot patch to get this game to work properly. I do not know where the patch my ISO is because I downloaded a pre-patched version that was reported already working.